For car lovers, Ferrari is the last word. It is the ultimate in luxury and looks, and its brand reputation and style makes it a household name worldwide. For every person, Ferrari represents something pure and luxurious. 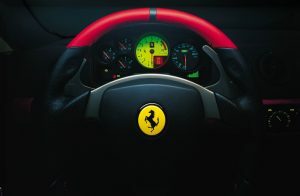 To capitalize on its brand image, Ferrari has ventured into other markets such as laptops, clothes and headphones. Ferrari has partnered with Logic 3 to create a new line of Ferrari headphones that are steeped in luxury and price. So far, Ferrari has released seven models of headphones, and each of them look exquisite and use some of the best audio technologies available today to offer superior sound to listeners. Its two prominent line of models are Scuderia and Cavallino. While Scuderia is bold and resemble its sporty racing cars, Cavallino is similar to its Italian sedan series of cars that look stylish, classical and tasteful. Ferrari Scuderia headphones combine high-end technology with attractive design to give users an excellent looking and high performing headphone. 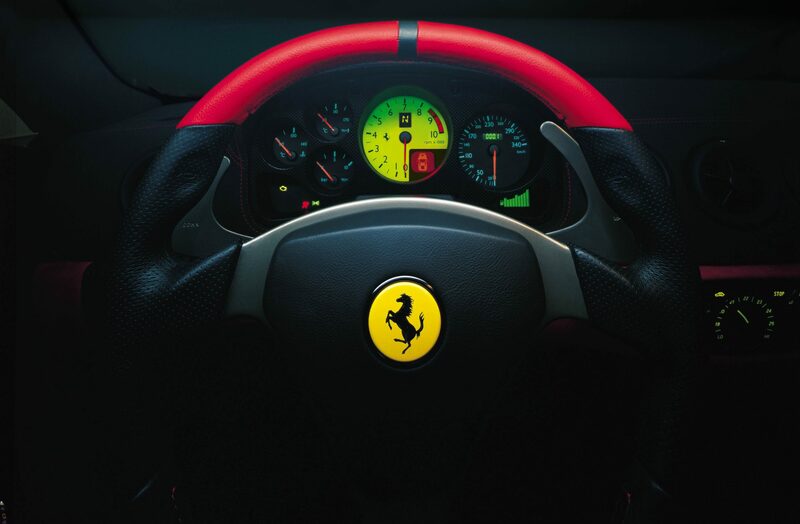 Design is one of the most striking aspects of the Ferrari Scuderia R300 as it lives up to the name of Ferrari. 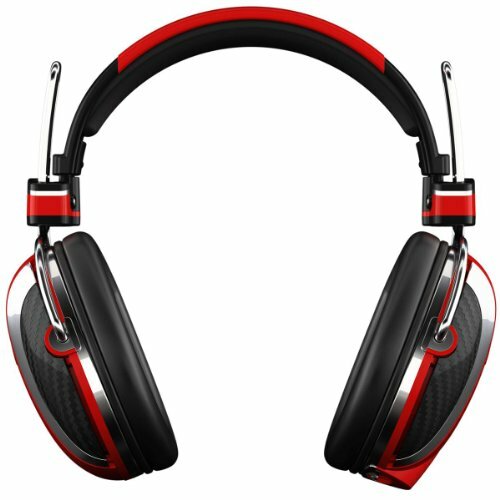 Set in a trendy looking red, black and steel colours, these headphones look great when worn. Its combination of trendy and classy colors make it easy for users to pair it as an accessory with any kind of dress. Moreover, the red swath present on the underside of head band give a sense of energy to users. The steel metal on the outer part of headband and on the back side of the ear cups give an elegant look while the red piping on the ear cups gives a dash of color to make the entire headphone look dashing. These headphones not just look good, but they also feel comfortable when worn. The head band swivels at a 90 degrees angle to meet the ear cups, and this mechanism gives a comfortable fit for any head size. The ear cups also pivot in four different directions to mold to the head shape of different users. Moreover, the head band has a sliding feature instead of the regular click-style to give users the choice to change the fit to meet their head shape. The heavy padding on the ear cups is comfortable and easy on the ears. Users can wear these headphones for extended periods of time because of this heavy padding. Along with these Ferrari headphones, users get a case made of carbon fiber, a three-button remote that is compatible with Apple phones, single button universal button and an adapter for airplane travel. In terms of performance too, these headphones are top class. It gives a range of sounds, from bass to treble, and each of these notes sound refreshing and natural. All the notes are well-defined and there is an overall balance between the different notes. Another striking aspect of these headphones is its clarity where every note is brought out clearly. This clarity is surprisingly present in both vocals and instrumental tracks. Furthermore, the thick padding provides a good amount of noise cancellation that helps to keep outside noise away. While these headphones do not come with active noise-canceling technology, the closed-back design and the heavy padding on the ear cups keep a lot of noise out of the way. Despite these nice aspects, there are also a few drawbacks to Ferrari Scuderia R300. One of the most prominent one is it does not fit well into the carrying case, thereby making it difficult to transport. Also, it is a little pricey but overall, it is a great piece of headphone to own. Ferrari is associated with style, luxury and of course, for great curves! All these aspects are a part of its AAV-1LFH009K Cavallino T350 Active noise canceling headphones. To start with, these headphones look stunning. It is modeled after an Italian sports sedan, and this inspiration is reflected in every part of its design – from its head band to ear cups. It comes with a metal and black finish that complements its design so well. The ear cups are curved outside the head band to give a protruded look. One can see the classic Ferrari horse symbol on the outer side of the right ear cup. The head band and the ear cups are padded with real leather to give a comfortable feeling for users. The ear cups, are specially padded in soft leather, that entices users to wear them all day long because it feels so soft on the ears. These headphones come with a black carrying case that is in tune with the style and luxurious feel of the headphones. Besides the case, it comes with three cables that are braided in black and have silver casings at the end. The first one is a standard cable that is plugged on the left ear cup, an Apple-compatible mic piece with three buttons and a single button mic piece that work well with non-Apple smartphones such as Android and Windows phones. Each cable is long at about four feet each, and they end in 3.5 mm jacks that are gold plated to add a touch of class to these headphones. The performance is not as impressive as the Ferrari headphones design in some areas. For example, the treble was too piercing while the midrange notes were relatively flat. Some sounds, especially instrumental ones, sound too bright and intense. The upside is that the low notes are surprisingly clear and detailed while the rock recording sounded bright and cheerful. Classics were also good on these headphones. Along with these upsides, the fact that it comes with a wide stereo field also improves the range of music that users can enjoy. Users who love car racing and those who aspire to own a Ferrari racing car, can find some gratification in Ferrari AAV-2LFH005R Scuderia P200 On-Ear Headphones as they are modeled after sports race cars of Ferrari. These headphones have the same design as the one used by Ferrari F1 race drivers, so they tend to be big and bright. For starters, these headphone look big and chunky. The ear cups are huge to fit almost any human ear while the head band is thick and easily adjustable. The color combination is a little gaudy with bright red, silver and black. In fact, this color scheme is one of the drawbacks of these headphones as they look a little weird. The outer side of the ear cups have a predominant red with white streaks, and this same red is present on the upper side of the head band. This red embellishment is made of plastic that looks cheap except for the Ferrari logo on it. The left ear cups have a metal clip or rod that looks more like a cloth hanger. This metal rod hooks the ear cups to the head band, and the slider makes it easy to adjust the head band. The right ear cups are directly attached to the head band, so there is no metal rod on that side. The heavy padding on the ear cups make it comfortable to wear for long periods of time, though the head band can cause a little discomfort on the skull after about three hours of wear. 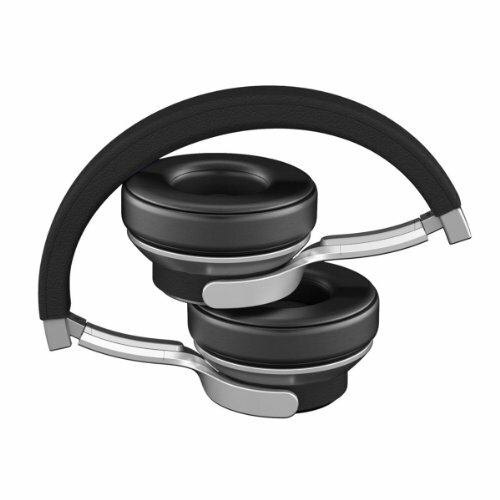 The design of the ear cups is semi-open which means these headphones allow some external noise to combine with music, and at the same time, keeps some outside noise with its heavy padding. Obviously such a design comes between closed-back and open-back designs, which means they have the advantages and disadvantages of both. As a result, it is not suited for those who have strong preferences for either closed-back or open-back design. The accessories that come with these headphones look cool, especially the fiber headphone case that even comes with a nice zipper. Like the previous models, this Ferrari model also comes with three cables that are completely detachable from the headphones. One is a standard cable, the second is a hands free cable while the third one is iOS compatible and comes with three button remote. In terms of performance too, the Ferrari AAV-2LFH005R Scuderia P200 On-Ear Headphones is bright and exciting. Its semi-open design gives a new feel to music, providing a wide well balanced sound. The overall tone is also warm and pleasant, and is sometimes even rich when needed. The bass is full and deep as it should be, and this makes these headphones a good choice for those who like to listen to music which is heavy in bass, such as hip-hop. However, the low end notes can sound booming while the midrange notes are a little hollow when compared to other Ferrari Scuderia models. Other than this defect, these headphones are thoroughly enjoyable, and is sure to appeal to music lovers who listen to different genres. Overall, these headphones are a great choice for listening to good music provided users can afford it steep price and a different design. Many people tend to associate Ferrari with a bright red and vibrant design. However, there is a soft side to it, and this is most evident in Ferrari AAV-1LFH008T Cavallino T250 On-Ear Headphones. 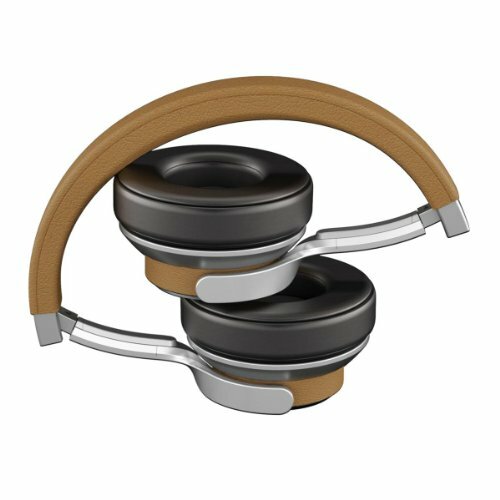 These headphones look neat and classy with the combination of tan and silver. The design of these headphones is a little curvy especially on the outer side of the ear cups at the area where it meets the head band. The head band is covered with good quality leather to give a comfortable feel to the skull, though the sides are not encased in leather. However, this design is not bothersome in any way as the padding on the ear cups make up for it. The padding is lush and generous and is made of excellent quality leather to make it feel super comfortable for users. Any one can wear these Ferrari headphones for long periods of time without feeling even the slightest discomfort. 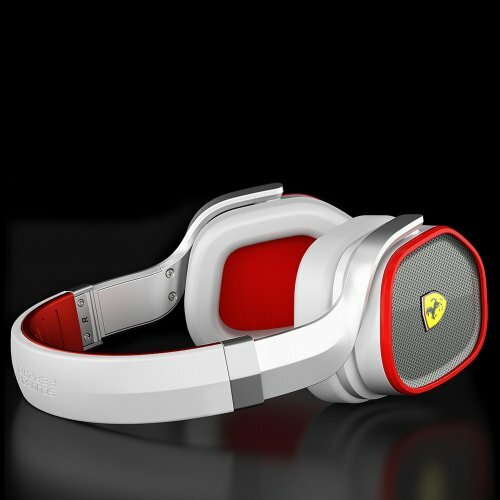 The overall design is tasteful and attractive to users while the Ferrari logo on both the ear cups add a touch of class. The design is closed-back, so noise isolation is good. Moreover, the use of 40 mm neodymium drivers make it the right fit for most ears when compared to those headphones that use 50 mm drivers, and hence tend to be larger. These headphones too come with three detachable cables – a standard cable, one for iOS devices and the other for other devices. All the three cables end in 2.5 mm plug that has the Ferrari logo on it. The performance is fairly decent with a good balance between different notes. The low end tends to be a little boomy at times while the treble is more stable. There is no piercing noise even at high volumes, and this is one of the upside of these headphones. The high notes are crisp, but the mid range notes tend to be a little flat and uninteresting. There is a good amount of clarity and detail in both vocal and instrumental tracks, but the bass is not as deep as it is in some of the other Ferrari models like Scuderia series. In a nutshell, these headphones look classy and sound nice. They are a good choice for those who love branded headphones provided they can afford the high cost. In short, Ferrari headphones combine its signature style and good quality design to offer excellent music to listeners. Though they could be on the expensive side, it is after all Ferrari, and there is a certain element of luxury associated with it. I’ve been hearing great things about Ferrari headphones. If you had to choose between the Scuderia R300 and the Cavallino T250, which one do you think is a better buy for your money? Hi Annie. That’s a good question.. It depends on what you’re after. If you’re looking for a stylish, portable on-ear headset, then the Cavallino T250 would be better suited to you. However, if you’re after a larger (and more comfortable) over-ear headphones, with a noise-cancelling capability, then the Scuderia R300 would be a better option for you!